IPFI: ESG Investing For Public Pensions: Does it Add Financial Value? Select your state of locality below and adjust the assumed rate of return and predicted mortality rate to see the effect of these changes upon their pension gap. Read about the Pension Gap Calculator Tool here. 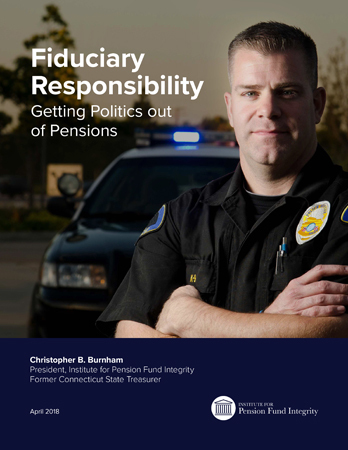 The Institute believes that officials residing over pension funds should be held to a high degree of fiduciary responsibility, consistently making decisions on investment that will benefit the long-term growth and security of the fund. Consistent dividend yield, resistance to market flux and strong corporate credit ratings are just a few variables that must be taken into account by these individuals. Often times outside interests have pressured pension funds and other entities to divest from certain investments under political pressures, which would subject pension funds to lower financial returns. This divestment would violate a pension fund’s fiduciary responsibility. Accounting for ESG factors in investments can prove to be advantageous with greater transparency and consistently high returns. With more than 80% of all corporations releasing ESG factor reports, options are plentiful for the investment of pension funds into holdings with positive ESG outlook. ESG factors should not dictate a political agenda for guiding public investment decisions. When investing with pension funds and other long-term payout entities it is imperative that long-term stock stability be sought after in the investment process. Part of the responsibility of the managers of pension funds is to identify long-term, low market volatility investments that will allow for prolonged growth and a sustaining of pension budget health for years on end.